I was there before the grand opening of Tim Ho Wan Malaysia at Midvalley, and my experience dining there was a good one. This time around, I received an invitation to try out their new range of mouth watering promotional menu. 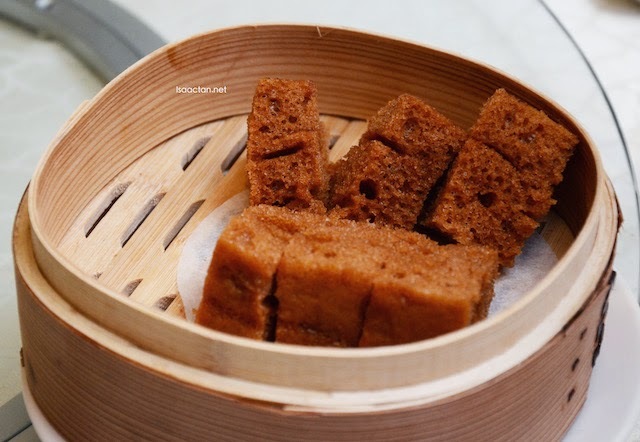 We got to try out the three all-new offerings on top of their delectable dim sum fares. Check it out below. 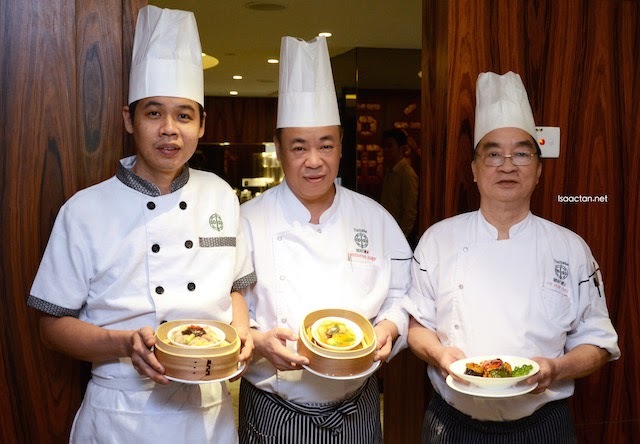 First to be debuted and exclusively available in Mid Valley restaurant is the Signature 5 Treasures shown above. 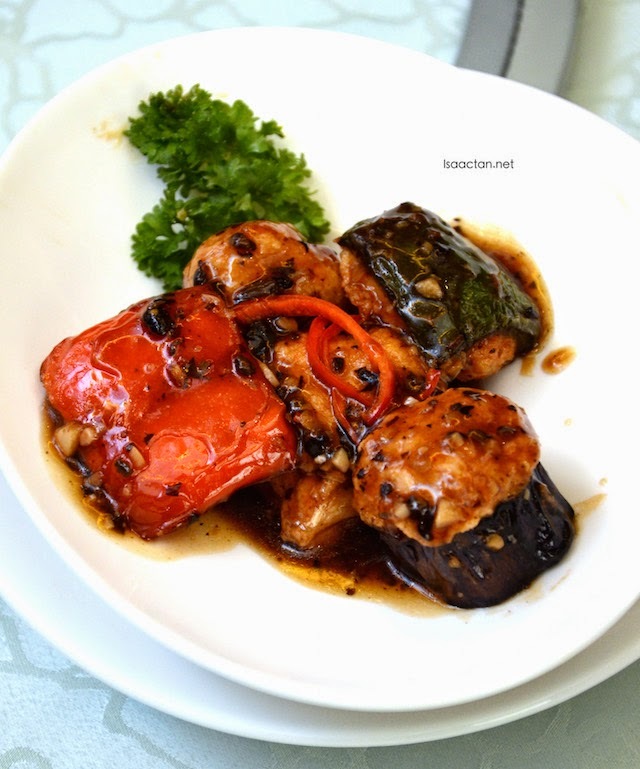 This irresistible savoury combines silky bean curd, deep fried tofu, capsicum and eggplant generously stuffed with shrimps and chicken paste accompanied by its Chef’s Signature, black bean sauce. 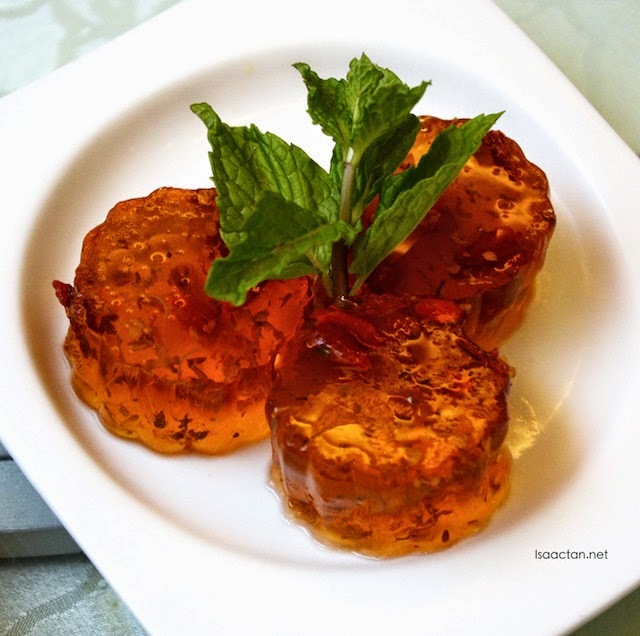 This healthy and colourful savoury is very much enjoyed by many dim sum lovers. Up next is yet another new dish off Tim Ho Wan's new promotional menu, the Steamed Chicken with Fish Maw. 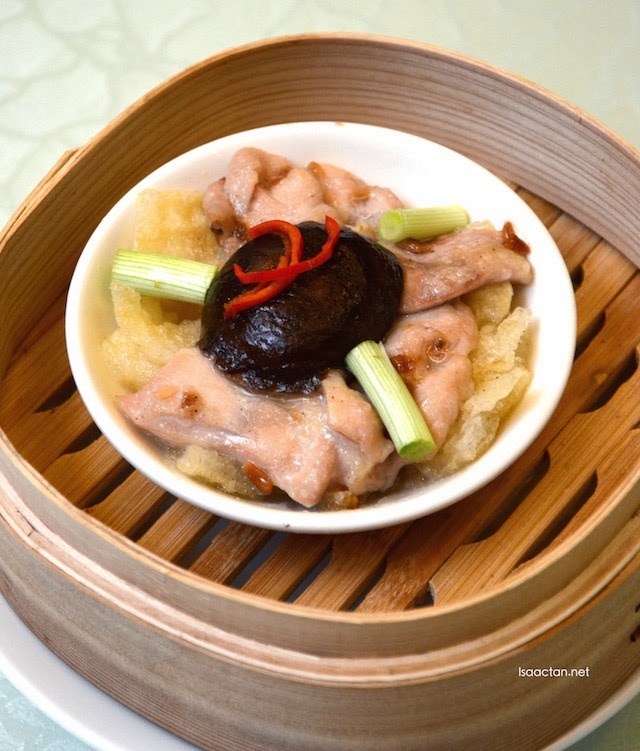 This dish invites you to indulge on the succulent and juicy, steamed-to-perfection chicken with fresh mushroom and fish maw in its silky abalone sauce. Mouth watering, juicy and tasty, worth the RM12.50 spent if you ask me. 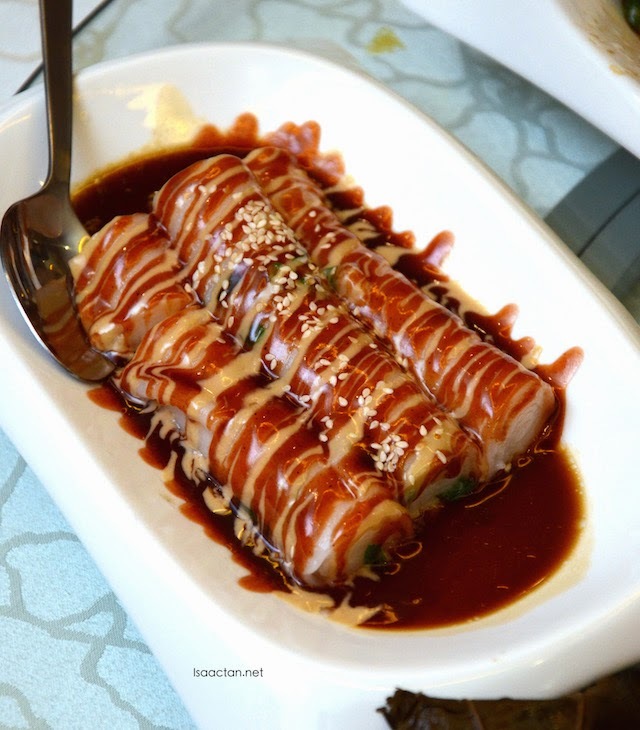 Make your way to gourmet-heaven with Tim Ho Wan’s Crystal Shrimp Roll with Century Egg. 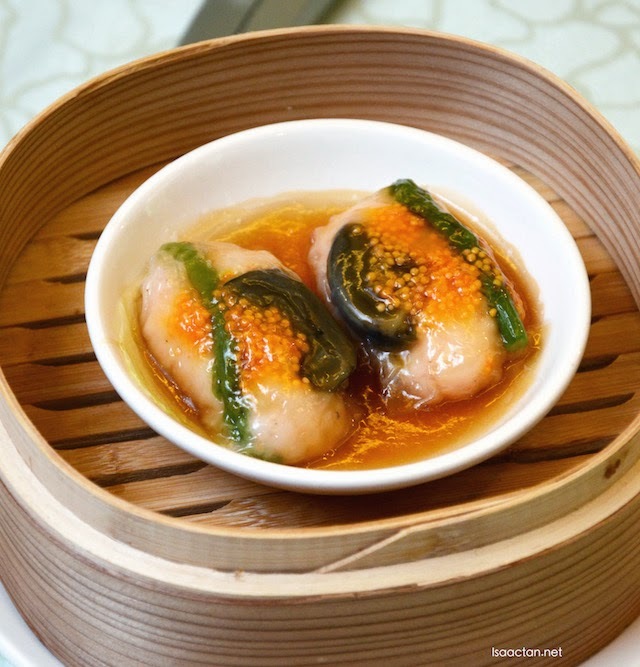 Wrapped within the crystal-clear rice dumpling skin is shrimp paste, asparagus, fish roe, and century egg For the finishing touch, the dumplings are then drenched in abalone sauce, yes you heard that right. Indulge all you want, where Tim Ho Wan guarantees a gastronomic dining experience at a conveniently affordable price. After the introduction to the three new dishes, we of course settled down to dine on the other offerings that Tim Ho Wan had on their current menu. 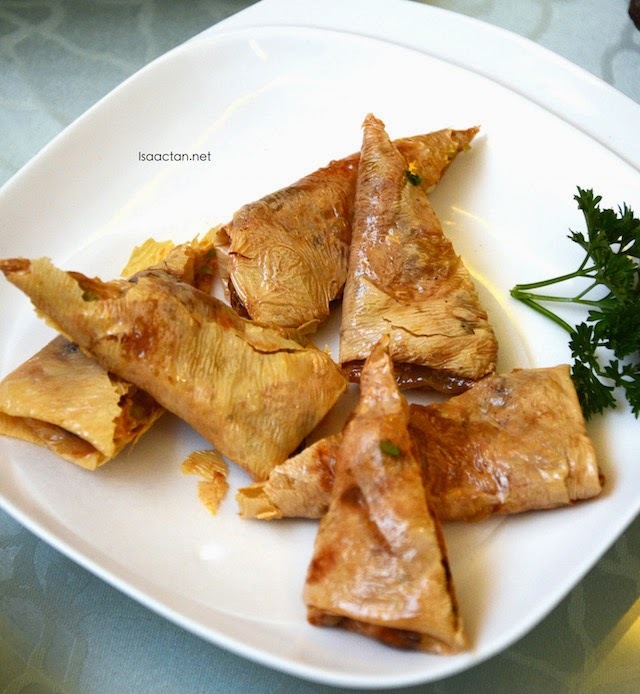 Shown above is the Beancurd Skin Roll with Shrimp which I absolutely love, due to its crispy outer layer and fresh tender juicy shrimps inside. 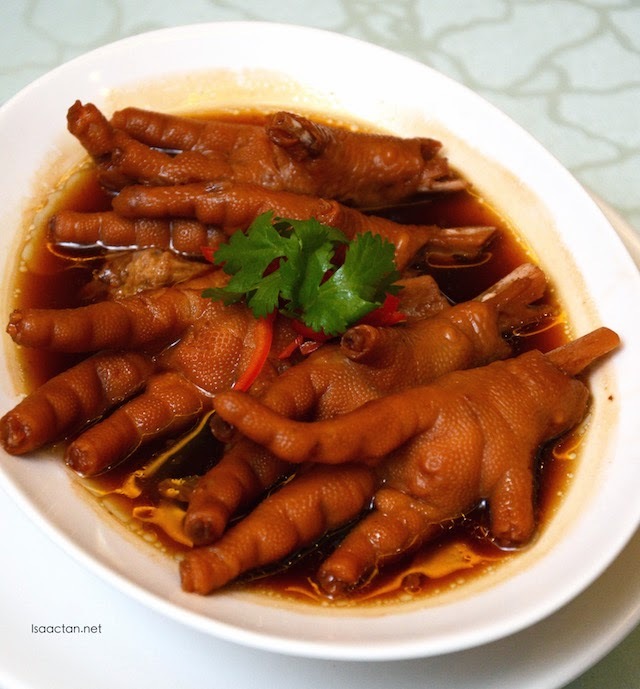 I'm not a big fan of chicken feet but I did hear their Braised Chicken Feet with Abalone Sauce is really good. The Vermicelli Roll with Pig's Liver had a unique taste to it. I'm no stranger to Pig's liver, loving it in my usual 'Koay Teow Th'ng', but the ones here were a tad different. The liver did not have that rough texture, and slid almost smoothly down the throat. I guess they must have used a higher grade one, or probably a more refined method of preparation was done. 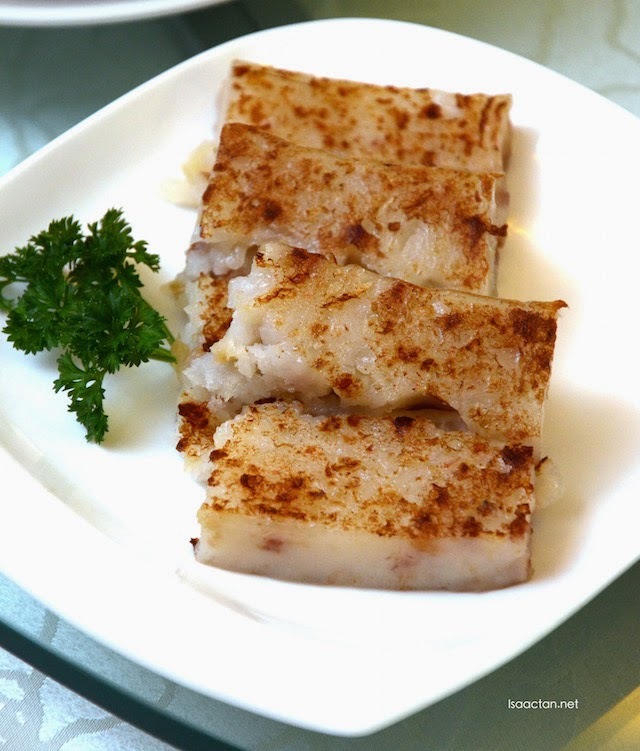 Part of Tim Ho Wan's Big 4 Heavenly Kings menu includes the above Pan Fried Carrot Cake. The other three are the Baked Bun with BBQ Pork, Steamed Egg Cake, and the uniquely delicious Vermicelli Roll with Pig's Liver. We had all of these that afternoon, and my were they good. I do love their desserts, which includes the very healthy and flowery tasting Tonic Medlar & Osmanthus Cake. 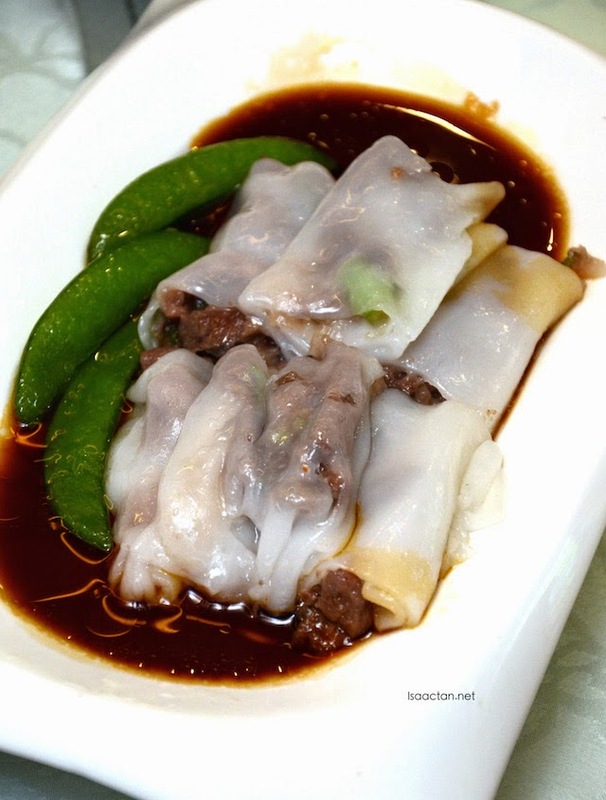 Do drop by Tim Ho Wan at The Boulevard, Mid Valley soon and try out their dishes if you haven't done it yet. Spanning 2 storey high, there were ample space for everyone. However these few weeks have been packed and saw long queues outside due to folks wanting to try out the famous Michelin star dim sum restaurant. Still have to queue? You can count me out - I will never queue for anything, never mind how nice. We pay money, we should not subject ourselves to such abuse. I know some places in other countries would put a time limit on diners some more - eat quickly and get out! Absurd!!! I wonder if they have a call and make an appointment system. That would be better than getting people to queue. I like to eat chicken feet. My fav! however I generally eat at Master cook Chinese Muslim. I wondering how chicken feet + abalone sauce taste.